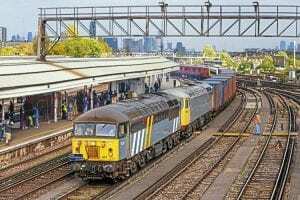 DELIVERIES of Class 707s for use on South Western Railway (SWR) services saw Nos. 707011/012 arrive in the UK on September 16, followed by 707013/14 on September 29. Then on October 14 Nos. 707028/029 were delivered to Clapham yard, however, the reason for the sequence jump is not clear. It may be related to how the units have been stored in Germany during the delivery hiatus. SWR uses two sets on a full day’s Waterloo-Windsor diagram, with a second pair working Guildford-Waterloo, Waterloo-Woking and Woking-Waterloo.